Sliding over the Zoe's bonnet before checking our seatbelts, that perennial question resurfaces: where now? Nowt new in Woodbridge. All but done Ipswich. Further afield to-do places in Suffolk are too far today. That French automobile mutely navigates itself to the A12 roundabout and points itself seawards. To the coast, we coast. Felicitations to that formidable furnisher of Felixstowe fry-ups, the Family Cafe, outside which we park. Mid-January in a seaside resort spells off-season for the opposing Corner House Cafe and Conservatory. Along the undercliff, however, is (or was) a dead pub. Remember Millar's, or the Felix, or even Old Millar's? 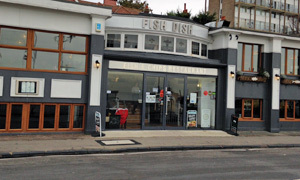 Gone and transformed into an asset of community value: welcome to the smart new visage of Fish Dish. Snappy name, snappy service, as we're welcomed by a charming chap. Over there is quieter, he says, and over here is warmer. Your choice. Good start. This must be the plaice. In the more temperate area -- predictable or what? -- we join the other diners and take a comfy padded seat. No coveted window seat for us, alas. On offer are charcoal grilled bass and bream, deep-fried tiger prawns and a selection of salads. Cannily, though, the F&C (fish and chips) are F&C (front and centre). For me, has to be the fillet of cod burger, while the driver opts for Cap'n Haddock. While that's being prep-ed, time for a chat over a pleasing glass of rare Ben Shaw's dandelion & burdock. There's rock and roll over the speakers as our platters emerge. Oh my cod is langourously draped in a bap and dressed with tartare and a cheesy slice: nice! Maybe it's the beef dripping. Maybe it's the local spuds from Denison's of Ipswich. Maybe it's a secret that Alper, the manager, has brought down from Whitby. Whatever it is, readers, these are some champion chips. Proper ketchup, too. Kev, our hard-to-please absent colleague, later told us that when the family want battering, he comes here. That's a recommendation. Great grub, super service, and comparable with the also very decent Cumberland Fish Bar over in poshy Woodbridge. Bellies bulging, we roll into the chilly air. Just time to nip into the neighbouring Little Ice Cream Co. for a reliable takeaway latte. Fish Dish? First class. If it was a car -- Austin "Landcrab" 1800. If they were passing by -- Fatima Whitbread.